Urška Pompe was born in Jesenice, Slovenia, in 1969. After earning her diploma in composition at the Academy of Music in Ljubljana (1993, with prof. Dane Škerl), she continued her studies at the Franz Liszt Academy of Music in Budapest (composition, chamber music, solfege) and in Basel, Switzerland (composition with Roland Moser). 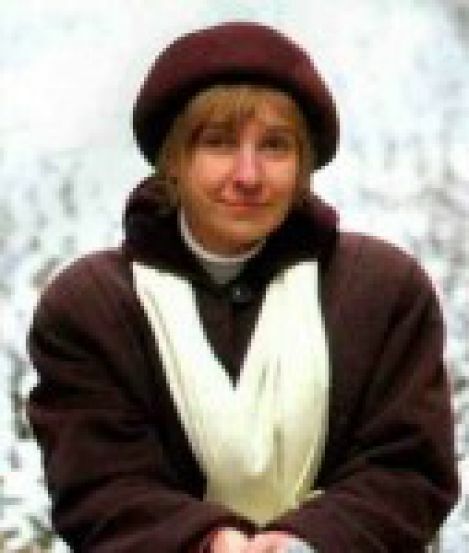 During her post-graduate studies she supplemented her knowledge by participating in numerous international masterclasses and meetings with acknowledged composers and instrumentalists, which played an important role in the ongoing maturation of her creativity; composers: Brian Ferneyhough, James Dillon (Royaumont), György Kurtág, H. Lachenmann, Ivan Fedele (Avignon), Jonathan Harvey (Szombathely); piano: Pierre-Laurent Aimard; chamber music: Perényi Miklós, Gulyás Márta. Her music is performed regularly in Slovenia and has been presented at various international festivals both in Slovenia and abroad, including the ISCM World Music Days (Ljubljana 2015, Zagreb 2005), the Zagreb Biennale (2009, 2015) Mouvement – Musik im 21. Jahrhundert (Saarbrücken), Musik unserer Zeit (Münster), Rostrum Paris, Freiburger Klang-Sequenzen (Freiburg), Gödölö Chamber Music Festival (Hungary), Festival Radovljica (Slovenia), Slowind Festival (Ljubljana, Freiburg, Strasbourg}, World Saxophone Congress, Expan (Spittal an der Drau, Austria), Carinthische sommer festival (Ossiah, Austria), Slovenian Music Days, (Ljubljana 2011, 2015), Festival Ljubljana (2008, 2014), New Dimensions (Seoul, South Korea) and the Cavaffy Symposium, Georgia State University (Atlanta, USA, 2013), Orkiestra Muzyki Nowej (Katowice, Poland, 2016). International artists and distinguished Slovenian performers such as Bernarda Fink, Françoise Kubler and Theodor Anzelotti, as well as ensembles such as the Slovenian Philharmonic, the Slovenian Philharmonic Chamber Orchestra, the Slovenian Chamber Choir, the RTV Slovenia Symphony Orchestra, Trio Ecco, the Slowind woodwind quintet, the Tomkins vocal ensemble and ensemble MD7 have performed her works. Her music has earned her numerous prizes and acknowledgments, including the Student Prešeren Prize (1991), First Prize in the Alpe Adria Giovani Composition Competition (1994), a Royaumont Fellowship (1994), Scholarship to attend the Centre Acantes for chamber music and composition (György Kurtág, 1995), First Prize at the Young Composers in Leipzig Competition (1995) and a stipend from the British Music Society to attend the Gaudeamus Music Week (1999). In 2007 she received the highest state cultural prize in Slovenia - the Prešeren Fund Prize - for her achievements during the previous two years. Several of her works have appeared on CDs recorded by various Slovenian artists and ensembles, including those by soprano Barbara Jernejčič-Füršt, flutist Matej Zupan, clarinettist Jože Kotar, Slowind and ensemble MD7. In 2010 her portrait CD “Brst” was released on Slovenian Radio’s ZKP label featuring chamber works and Near for two saxophones and orchestra. Since 1998 she has taught solfege at the Ljubljana Academy of Music, where she is currently associate professor and head of the ear-training department. During the 2015/16 academic year she taught at the Zagreb Music Academy, Croatia. The title is an excerpt from a poem Renascence by american poet Edna St. Vincent Millay (1892-1950). Music does not try to illustrate the content of the poem, it is rather a simple musical thought I wanted to develop and research.